We've set up tools to make transferring your domain as quick and easy as possible. 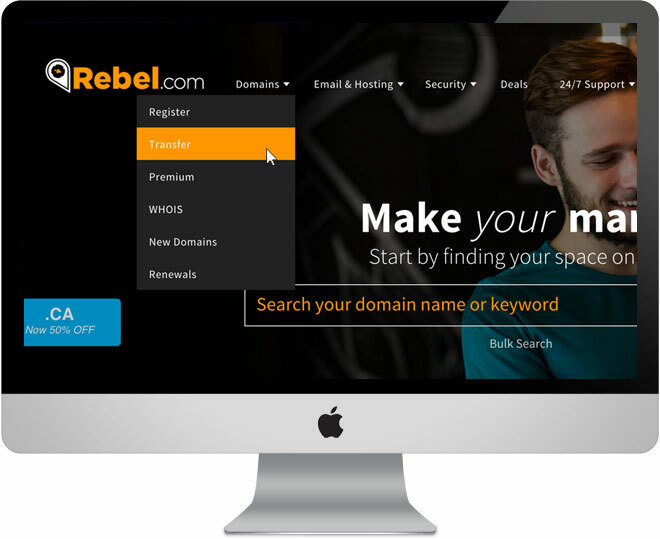 Every domain with Rebel.com enjoys the full benefits of our services: our comprehensive domain manager, customer support, hosting and SSL. Also, every domain transfer includes a one-year extension to the expiry date. We even have a Bulk Transfer tool to move your whole portfolio at once! How Do I Begin Transferring My Domain(s)? First you need to do a background check on your domain(s) with your current registrar. With some TLDs, your domain(s) must be atleast 60 days old from when you registered it. Next your domain(s) must be unlocked: go to your registrar's domain manager and unlock your domain(s). For your security, domains cannot be transferred until they are unlocked. Now you must verify that your administrative contact email address is still accurate, since we need to send a confirmation email. If your email isn’t valid, we won’t be able to reach you and initiate the transfer. Please note that this process is not always applicable and varies on the TLD, for example: .CA domains do not need e-mail verification to proceed with the transfer. Last but not least you need to access your Authorization Code from your current provider. You can find this in your domain manager by clicking on your domain(s). Click on “Authorization Code” or emailing your registrar directly. Keep this code handy for when you begin your domain(s) transfer. Now your ready to begin your transfer with us. To begin the process, first visit us at Rebel.com and click Domains > Transfer in our top navigation dropdown. Now it's time to type in the domain you wish to transfer with us and click Transfer. Type in your Authorization Code in the text box and click “Add to Cart”. If you followed the steps at the beginning of the article your domain should be available for transfer, if you are unsure please refer to "How Do I Begin Transferring My Domain(s)?" at the beginning of this article. Proceed through checkout. The status of your domain will be “Pending” until your previous registrar verifies your credentials and Authorization Code. Your transfer may take up to five days (based on the other registrar), but will complete automatically. In the mean time, manage one or many transfers quickly and easily with our custom-built Transfer Manager. The transferred domains will then automatically appear in your Domain Manager. For more information about inbound domain transfers please contact our Customer Support center or click here for our FAQ articles.